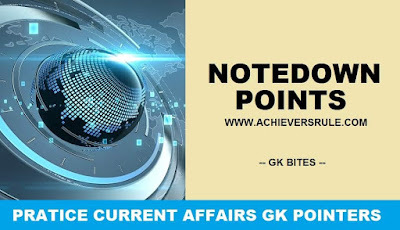 Indeed we have conveyed to you One Liner GK and Current Affairs - 7th June 2018. These are an arrangement of Latest News Headlines with GK Points in view of the essential news have been said toward the finish of the article. These are vital for the up and coming examinations of IBPS PO, IBPS CLERK, SSC CGL, SSC CHSL and other competitive examinations. Applicants ought to experience these in subtle elements to gather point by point data on some particular themes. Likewise, take after the Daily Current Affairs Updates and Daily Current Affairs Quiz all the time. The Centre has constituted a group of eminent persons headed by Industrialist Baba Kalyani to study the Special Economic Zones, SEZ Policy of India. According to a new trade report by the UN, Foreign Direct Investment to India decreased to 40 billion dollars last year from 44 billion dollars in 2016 while outflows from India, the main source of investment in South Asia, more than doubled. The monetary policy committee of the Reserve Bank of India (RBI) decided to hike the repo rate by 25 basis points to 6.25 per cent while maintaining a neutral stance. IIT-Bombay has emerged as the country’s best university in the latest edition of the QS World University Rankings. According to a Forbes' compilation topped by American boxing champion Floyd Mayweather, India cricket captain Virat Kohli is among the world's highest-paid athletes. According to the Sample Registration System (SRS) , India has registered a significant decline in Maternal Mortality Ratio (MMR) recording a 22-per cent reduction in such deaths since 2013. In a major push towards setting up a unique museum on the 'Prime Ministers of India' in the national capital, the Union Culture Ministry has formed three high-powered panels that will work to implement the project. The Telecom Regulatory Authority of India on Monday recommended setting up of a pan-India broadband public protection disaster relief (PPDR) communications network based on 3GPP PS-LTE technology for an ‘advanced, reliable, robust and responsive communication networks’ to be used during disasters. Indian Institute of Science (IISc) Folks Develop State-Of-The-Art ‘LifeBox’ For Drone Transport of Organs! Saudi Arabia has banned frozen and processed fruit and vegetable imports from Kerala amid concerns over the deadly Nipah virus outbreak. The Election Commission of India launched an online RTI portal to help applicants seeking information under the Right To Information Act. The Maharashtra government would provide financial grant of Rs 1000 per quintal to those farmers whose tur and gram could not be purchased by the administration before the May 31 deadline. The Information and Broadcasting Ministry and Prasar Bharati, which runs Doordarshan and All India Radio (AIR), have inked an MoU required for the release of financial allocation to the broadcaster.